Telling ISIS and Iran apart is challenging sometimes. Earlier this month, Iranian-born Islamic State (ISIS) operatives carried out a rare terrorist attack in Iran, a country where most of the terrorism is conducted by elements of the Iranian government against its own people. President Trump condemned the violence, but he also added "We underscore that states that sponsor terrorism risk falling victim to the evil they promote." The comment was quickly condemned in certain sectors of the media. Vox said the statement "eschews any moral or ethical high ground, let alone humanity." The Daily Mail called it "a diplomatic pouch full of Schadenfreude." It may be difficult to suppress schadenfreude over Iran's falling victim to the particular brand of asymmetrical warfare it developed and then exported to the world. But hope is a better sentiment. Schadenfreude might feel good for a few minutes, but instead we should hope that the Iranian people will pause in their mourning to reflect on the situation in ways their leaders seem incapable of doing. For instance, showing zero self-awareness, Foreign Minister Mohammad Javad Zarif blamed the attacks on "terror sponsoring despots." Iran's terror proxy Hezbollah cited evidence of an "international, destructive plan." We should hope that the Iranian people are struck with a collective epiphany: the grief they are currently experiencing has been inflicted by their government and its proxies upon Americans, Westerners and Jews since 1979 when Ruhollah Khomeini declared himself "Supreme Leader." Iran's Islamic Republic invented modern suicide terrorism. Ali Khamenei, the current "Supreme Leader," downplayed the ISIS attacks as "fireworks." He predicted that they will "have no effect on Iran," and declared them "too small to affect the will of the Iranian nation and its officials." Interestingly, he didn't mention the Iranian people. The delicious if bitter irony to these "fireworks" in which five men and one woman simultaneously attacked the Iranian parliament and the shrine of Khomeini, was underscored by their use of suicide bombs (Khomeini being the inventor of suicide terrorism). Between 1945 and 1979, there were no documented uses of suicide attacks anywhere in the world. The Japanese Kamikazes disappeared after World War II, but shortly after the Iranian Revolution, suicide terrorism first appeared when Khomeini's Islamic Revolutionary Guards Corps (IRGC) facilitated a suicide attack against the Iraqi embassy in Lebanon in 1981. Iran turned Lebanon's Bekaa Valley into the cradle of suicide terrorism, where it was passed on to the Palestinian terrorist groups, the PKK and others. But Khomeini did more than bring suicide terrorism to the world. He turned it into a commodity. Ayatollah Ruhollah Khomeini is singularly responsible for the emergence of modern suicide terrorism as we know it today. Months into the Iran-Iraq war, before the Iraqi embassy bombing, Khomeini began using children as combatants. On October 30, 1980 a child warrior named Hossein Famideh allegedly crawled beneath an Iraqi tank and exploded a grenade, thwarting the Iraqi advance. Khomeini used the 13-year-old Famideh as a role model and built a culture of suicide terrorism. Soon a monument to Famideh was erected, and the boy's likeness was everywhere, on book bags, murals, posters, and stamps, along with Khomeini's invitation to follow Famideh's lead and "drink the nectar of martyrdom." Those who know nothing of Islam pretend that Islam councils against war. Those [who say this] are witless. 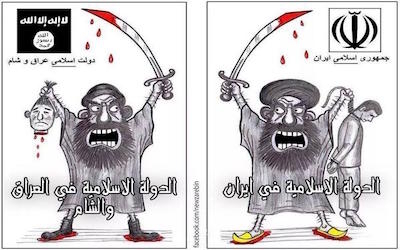 Islam says: kill the unbelievers just as they would kill you all!...Islam says: kill them, put them to the sword!...Islam says: Kill in the service of Allah those who may want to kill you!...Islam says: Whatever good there is exists thanks to the sword and in the shadow of the sword! People cannot be made obedient except with the sword! The sword is the key to Paradise, which can be opened only for Holy Warriors! This version of Islam has brought Iran and the world to the current predicament. 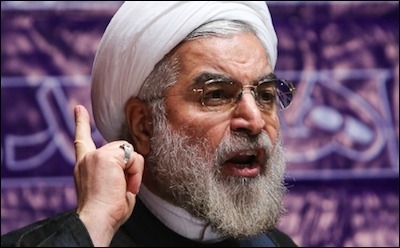 According to Iranian President Hassan Rouhani, the November 2015 Paris terror attacks happened because Western countries "tried to use terrorism as a tool" in Syria, whatever that means. Iranian government officials blame the US for the attack, making it even more difficult to feel their pain. But this is to be expected, and we should not let our contempt for the government spill over to the Iranian people. Iran also blamed the US for the November 13, 2015 ISIS attacks in Paris. Khomeini even blamed the US for the siege of the grand mosque in Mecca on November 20, 1979. 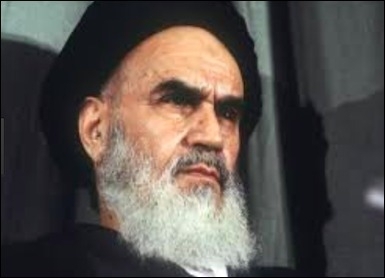 Juhayman al-Utaybi and his followers, conducted that attack, but Khomeini blamed the "Great Satan" and stirred anti-American uprisings across the Muslim world. So when Iranian ISIS suicide bombers targeted Khomeini's shrine, it was surely meant to send a message. Americans should resist indulging in pleasure over the tables turned. Americans, including the president, aren't the only ones indulging. Joshua Davidovich at The Times of Israel observed that Israeli reaction to the attacks "vacillated drunkenly in the large gap between snot-nosed schadenfreude over a country that supports terror and genuine horror and concern." It's hard to be magnanimous to those who want us dead, and it's difficult to shake the impression of Iranian chickens coming home to roost, but schadenfreude will fade and concern will win out. Back to hope. After 9/11, the Iranian regime cried crocodile tears for the dead while harboring bin Laden's family and other Al-Qaeda members, allegedly under "house arrest." But the people of Iran broke out in spontaneous demonstrations against Al-Qaeda, complete with home-made American flags and chants of "Death to the Terrorists" replacing the regime's preferred "Death to America." So threatened were the Mullahs, in fact, that the Basij was reportedly sent to attack protesters on the next night and police disbursed crowds thereby preventing more demonstrations. We must retain our humanity even against enemies who have abandoned theirs. Now, like so many of the victims of Iranian-sponsored terrorism from Buenos Aires to Beirut and everywhere in between, the Iranian citizenry is engaged in the gruesome aftermath of a terrorist attack. After they have picked up pieces of human flesh from the 17 fatalities and cleaned up the mess, but before they rebuild what was destroyed, let's hope the Iranian people are overwhelmed by a wave of empathy for the suffering of thousands of victims of Iran's reign of terror. And let's resist the tendency to indulge in schadenfreude. Rather than dwelling on the miserable symbolism in the attack, Americans and all victims of Iranian terrorism should instead show how we retain our humanity even against enemies who have abandoned theirs.